Unaffected by the recent Volcano Flow...10+ miles north of eruption. 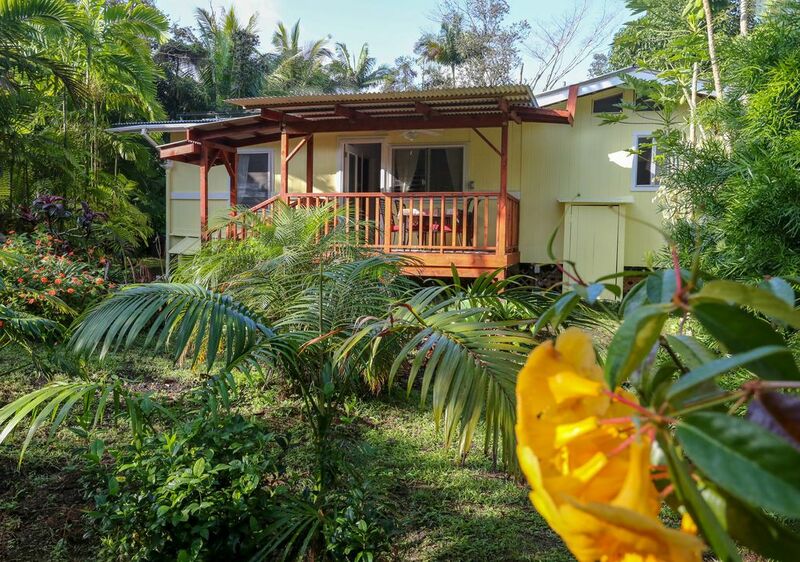 Beautiful cottage in tropical setting with lanai overlooking lush tropical garden. Newly remodeled 2 bedroom one bath with full kitchen . You have free WiFi and cable. Comes with great queen size bed as well as a twin bed. We also offer an inflatable queen size mattress . This cottage is for no more than 5 guests. Garden area is rough, lava. Children should be supervised if wanting to walk the garden. You are centrally located to visit many areas of interest while visiting our island. We are located close to a hike to Shipman Beach. Kapogo tide pools, warm ponds and pohoiki for surfing are 15- 20 minutes away..
Visit black sand beach or the volcanoes. ** There is a $200 Security Deposit. Should the key is lost or not returned your deposit will be forfeited. This will be billed separately thru our Square App. Due upon booking the reservation. Guests are responsible for cleaning dishes and putting trash into trash receptacles.